I feel like there has been a lot of cake around lately. If I'm not making them, I'm going to parties that have them. But, I'm not going to complain because I love celebrations and get-togethers. 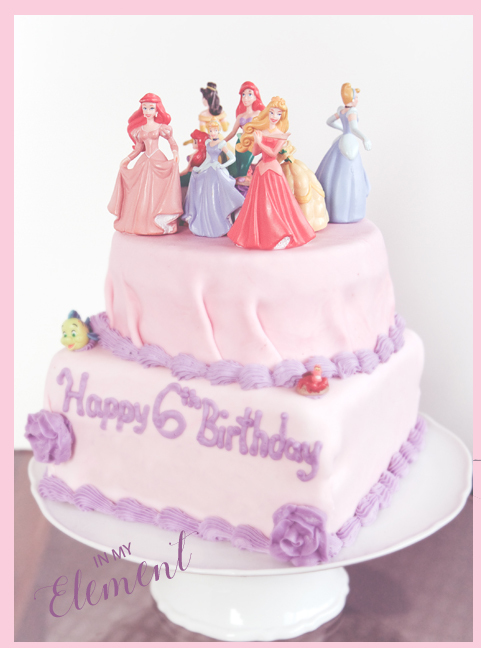 This year for my daughter's birthday, she wanted a princess cake again. I have been wanting to try fondant for a very long time. I was nervous about fondant and avoided it for as long as I could. There was a time I bought fondant at the store and just couldn't work with it. This put me off for a while. But I knew that fondant and I would meet again. Somewhere, in a dark kitchen corner, I would be ready with my rolling pin. I would prevail this time. This is a marshmallow fondant recipe. Easy to make and work with. I have to say, I will never, ever worry about using fondant again. I don't even think I will bother with icing cakes with icing sugar either. This was much easier. For the top tier, instead of smoothing the fondant back in, I folded it over so that it looked like ruffles of a dress. My friends all liked the look of it and they also liked the taste of it. They didn't find it overly sweet, like I find icing usually to be. It was a hit. And my princess was happy. Grease a microwave-safe bowl, a spoon, the dough hook, and the bowl of your stand mixer with vegetable oil or shortening. Microwave the marshmallows and water in the greased microwave-safe bowl for 60 seconds. Stir with the greased spoon. Microwave for another 30 seconds, if all the marshmallows have not melted. Stir in flavoring. Mix together the icing sugar and salt in the stand mixer bowl, reserving 1 cup. Make a well in the center and pour in the marshmallow mix. Mix on to the lowest setting and increase the speed up one setting, when it starts to sound strained and stop mixing once all sugar has been incorporated. If the fondant is sticky, add the reserved confectioner’s sugar 1/4 cup at a time. Spoon the fondant out onto plastic wrap. Rub a bit of shortening or oil on the outside of the ball. Wrap in plastic wrap, place in a ziploc bag, and let rest for at least 2-3 hours. Keep unused portions covered when not using. If the fondant becomes stiff, place in microwave for 20 seconds at a time until pliable. Add coloring of your choice to the fondant and knead onto greased surface. Roll out to the desired thickness and cover your cake.